After Tiger Roll's heroic success at Aintree on Saturday, his owner Michael O'Leary had the nerve to propose a hat-trick was not going to be possible, as he expects next year's Cross Country Chase to be his final outing before retirement. Yes, you do question the horse's welfare having completed two Grand Nationals, and participated in over thirty races under rules. But if the horse is fit and well, surely this would be the best opportunity for any horse to emulate the achievements of Red Rum, and land thus a hat-trick. Just like most of the population, trainer Gordon Elliott is much more open-minded about a crack at a third National and senses an opportunity for immortality. Elliott would be the man to change the mindset of O'Leary, who was once adamant Apple's Jade would not run in a Champion Hurdle, only for her to do so - albeit unsuccessfully. Likewise with this horse, O'Leary confirmed after Tiger Roll's fourth success at the Cheltenham Festival in March that he would not be heading back to Aintree, again only for him to do so and to win again. The owner of Ryanair could just be operating one or two mind games, but if he is fit and well, surely he must go for glory. Arguably the biggest challenge facing Tiger Roll next year if he turns up, is the weight he carries. Martin Greenwood - the BHA's handicapper in charge of the weight proceedings, branded the nine-year-old's performance as the best there has been for 45 years, and no doubt, he will crucify him in the weights. Having been officially rated 172 following Saturday's success - one pound below the great Crisp, who finished second to Red Rum off a humongous weight back in the 70's, it is unlikely he will be saddled with anything other than the top weight of 11st 10lb. Many Clouds carried one pound less to victory in 2015 [11st 9lb], but failed to follow up under top weight the following season and even the great Red Rum was unsuccessful in his third and fourth attempts aged ten and eleven when he headed the lists. Gold Cup runner-up Anibale Fly carried top weight this year and could manage only fifth, more than 16 lengths adrift of Tiger Roll. No horse has ever won three in consecutive years, and although the tiger defied a big raise this time around, the task of top weight is rather daunting. Like all of us, no one is getting any younger. Horse's lives are far shorter than us humans, and the more mileage they bill up, the more infringement it may bring to their legs. Tiger Roll will be a ten-year-old next year, but proof in history shows this is no impediment to success. Half of the National winners this century have been aged ten or older; the only concern would be what impact the race has left on his body. The tiger has not only competed in two Nationals, but almost a third of his races have been over a distance of three-miles. Bidding to emulate Red Rum's record of three Nationals, connections and fans of the sport will be well aware that Ginger McCain's former star won his third at the age of twelve. Further proof that age is just a number. Tiger Roll has proved utterly versatile with regards to distance and ground throughout his career, but again, the task of carrying a high weight in tough heavy going could spell trouble. He beat the Willie-Mullins trained Pleasant Company by only a head on heavy going back in 2018, carrying a weight of 10st 13lb and he would be carrying almost a stone more in 2020. His best efforts have come on better ground, and he was somewhat fortuitous with the conditions this year, with heavy rain on Thursday eventually transitioning into gorgeous sunshine on the Saturday. The gods were clearly with him, and he would be at his optimum on good bouncy ground, which saw him prevail in the only Grade One of his career to date - the JCB Triumph Hurdle at the Cheltenham Festival. Finally, the challengers will have the final say on whether Tiger Roll can produce further history. This season's win proved far more comfortable than his victory twelve months ago, but the opposition will arrive once again in abundance. Tiger Roll won the Four-Miler at the Cheltenham Festival back in 2017, and that has proved a good trial for the race in recent years. 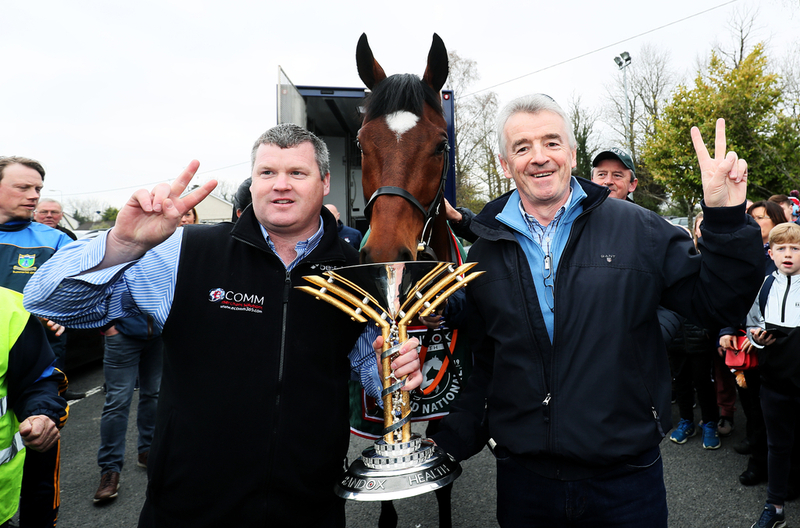 Le Breuil and Discorama showed the required stamina and tenacity when battling it out at this year's festival, but Rathvinden - a winner twelve months, ran a fine race under Ruby Walsh to finish third this time around and could be back for more. New signing Blaklion and the mare Ms Parfois both missed this year's race due to injury and cannot be discounted either in the future, nor can Jessica Harrington's Magic Of Light, who will look to better her excellent runners' up spot from the weekend just gone. A lower weight would suit Anibale Fly's claims, softer ground would favour Walk In The Mill's chances and no other horses in the race would bring Don Poli into contention. A better preparation could also assist the 2017 National winner One For Arthur, who after a difficult season unseating on both starts, stayed on noticeably well to come home a creditable sixth. Colin Tizzard always seems to do well at Aintree and although dual Topham Chase victor Ultragold failed to stay in this year's big race, he could have a number of high-class potentials in 2020, including Welsh Grand National winner Elegant Escape. Mister Malarky looks a strong stayer on the up, whilst the race could come into consideration for 2018 Gold Cup hero Native River, with the marathon trip sure to be right up his street.